Previously I have written about custom harmonicas, custom combs and techniques such as reed slot sizing. It can seem like quite a lot to consider and for the average player it probably is. In this article I want to highlight the two things that most increase harmonica playability. I have focused on ease of playing and sound. Let me first say that if you buy custom harmonicas, the modicfications I mentioned here will definately already be implemented. This is for the player who is mostly satisfied with out-of-the-box harmonicas. You can see them as the first steps towards more advanced high-end instruments. The thing that I have noticed that increase the harmonica playability most for me is the reed gap setup. Whenever I have a problem with unresponsive reeds I can most often fix it by tweeking the reed gap. Getting this right i dependent on your playing style. The second thing I recommend is to get the harmonica properly in tune. Which tuning scheme you should choose depends on what type of music you play. For blues players I recommend compromised just intonation. If you only play second position and solo you can also consider pure just intonation. Joe Filisko made an interesting comment at HMW 2018 when asked about custom harmonicas. He said something like “my personal harmonicas are quite rough but I am fanatical about tuning”. If you choose to buy a custom harmonica then harmonica playability will not likely be a problem. I have harmonicas from J.A. Harmonicas and they are beautifully set up to work with my playing style and tuned just the way I like. 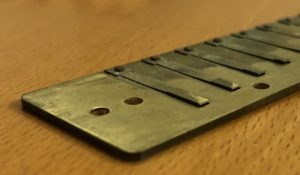 If you want to stick with out-of-the-box harmonicas then reed gapping and tuning is what I recommend you do to get the most out of your instruments. Reed gapping for how the instrument plays and tuning for how it sounds. When a diatonic harmonica leaves the factory it has a form of generic setup. This generic setup is meant to work for most people. This also means that it will probably not be optimal for you. Depending on your playing style you may need to do reed gapping to get a perfect harmonica for your style. In this article I give an overview of setting the reed gap and the effects it will have. The reed gap is the distance between the tip of the reed and the reed plate when the reed is at rest. This distance will decide how the reed respond to different air pressures when you start playing a note. If the reed gap is set very low, the reed must be started with very low air pressure. After the vibrations starts the volume can increase. The reed will not even vibrate if the air pressure is to high. If the reed gap is set very high, the reed will need high air pressure and lots of air to start vibrating. If there is too little air or too low air pressure the air will just move past the reed and no sound is made. Not too high and not too low. The reed gap also determines how the harmonica responds to bends, overblows and overdraws. For draw bends the corresponding blow reed need to be set sufficiently low for it to be engaged when the draw happens. The same thing is true for the corresponding draw reed and overblows. Getting the right reed gap is dependent on your playing style. If you play very softly you need the gap to be low. High gap is needed if you normally play forecfully. The right balance for you is when you can play both softly and forcefully on the same harmonica. If you have sprecific needs you may need different sets of harmonicas for different styles. I remember going to a worskhop a few years ago with Marc Breitfelder who said he has three different sets of harmonicas. A “normal” set, a set for extreme overbends and a set for country harmonica vamping style. You don’t need any complicated tools to do reed gapping. You can use a reed lifter tool, your nails or paper clip to gently push the reed upwards or downwards. Very little force is need so be very careful. You are aiming dor very small adjustements so don’t go too much by your eyes. If the action feels right when you play, it is right. 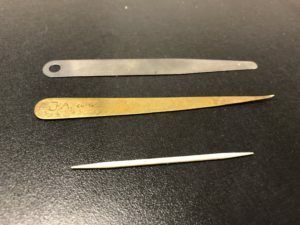 Possible tools to use for reed gapping. Reed gapping is the modification I think is almost mandatory for all harmonica players. It is not a very complicated modification but you do have to be careful not to bend any reeds. Do it first on old harmonicas until you feel comfortable with it. I think adjusting the reed gap is something that you should consider doing before getting a custom comb even. With the right reed gap you will get a much more playable harmonica suited to your style. If you have any questions, please don’t hesitate to contact me and don’t forget to sign up below to get the Welcome package and exclusive articles!